Richard Cohen OAM was the founder, Chairman and together with Patricia Cohen the creator of Burnside Village Shopping Centre and the Cohen Group of Companies. His lifetime legacy is now a sophisticated family business based in South Australia and has created a non-for-profit Foundation in his honor. The Cohen Group Board of Directors has resolved to establish the Burnside Village Foundation (BVF). South Australian individuals to assist in achieving their dreams. This can be but is not limited to the arts and education fields in Adelaide for the purposes of recognising excellence and genuine community benefit in South Australia. The Foundation is the first point of call for community engagement looking for sponsorship and/or support. The Burnside Village Foundation Grant has secured my dream to study classical ballet at the prestigious Bolshoi Ballet Academy in Moscow. The grant provided essential financial assistance to aid my future development abroad as a classical ballet student. I have now completed my traineeship program, pursuing a specialty in Choreographic Arts and I will commence my three-year diploma on the 1st of September, 2017. Onwards and upwards for the second stage of my incredible journey at The Bolshoi Ballet Academy! Forever grateful to the Burnside Village Foundation. On a Monday morning in January, eight nervous teenagers from different regional locations in South Australia sat around a table not talking to each other. They had just arrived for the inaugural 2017 Summer Art Camp at Adelaide Central School of Art. An awkward silence filled the student common room as the teenagers imagined the week ahead. The camp was supported by a grant from the Burnside Village Foundation, which allowed the School to put together a diverse program designed to challenge, connect and inspire the selected participants. It also ensured the camp would be free. The teenagers who came to camp shared a love of visual art and the strong sense that it would be part of their adult lives. They came from as far afield as Waikerie and Mount Gambier, having been selected on the basis of merit, passion and need. 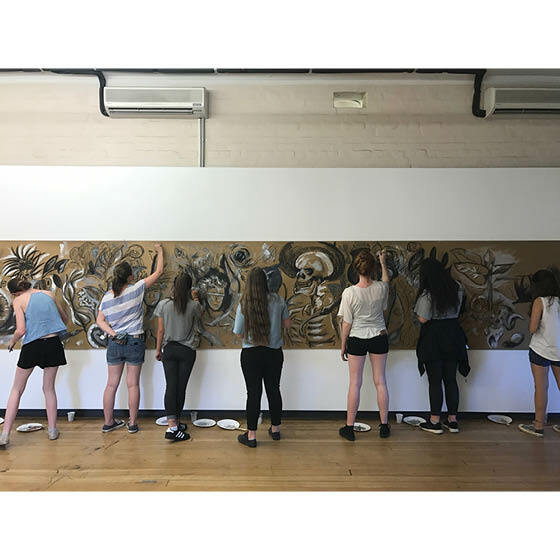 For four days the teenagers got an introduction to the visual art industry and a taste of life as a Bachelor of Visual Art student. They drew. They painted. They analysed work. They also ate a lot of ice cream. By the end of camp the silence was gone, replaced by the buzz of friendships newly made and a sense of excitement about the years to come. “Summer Art Camp was really amazing. I didn’t expect to come into a community that is so engaged in the visual arts and that is so supportive as well. I’ve never really experienced that, being a regional student. Being around people who understand you is awesome. Each enquiry will be made to the Burnside Village Foundtion via an Burnside Village Foundation – Application Form (click the link to download the form) or by emailing bvf@cohengroup.com.au. The completed application form is to be emailed to bvf@cohengroup.com.au or posted to Burnside Village Foundation, ATT: Carly Cunningham, PO Box 145 Glenside, SA 5065. Acknowledgment of receipt of application will be sent to the applicant via email confirming the application has been received by the Foundation. The committee may take up to 28 days before formally responding. The Foundation committee will decide whether it is an event or initiative that the Foundation will be in a position to support. The Committee has no obligation to approve all requests and reserves its rights to accept or deny accordingly. A maximum of 3 applications will be granted per financial year. Once this limit has been reached all applicants will be contacted with the opportunity to re apply the following financial year. PLEASE CONTACT THE FOUNDATION AT BVF@COHENGROUP.COM.AU OR ON (08) 8338 1911 TO CLARIFY ANY OF THE ABOVE INFORMATION OR TO DISCUSS YOUR APPLICATION SHOULD YOU HAVE ANY FURTHER ENQUIRIES.